FORT GREENE — Three teachers traveled for eight months visiting educators in classrooms nationwide before coming home to found Compass Charter — a school that encompasses the best practices they learned on the road — in Fort Greene. Michelle Healy, Brooke Peters and Todd Sutler began their journey, called The Odyssey Initiative, in September 2012 with the goal of observing what works well in the American education system. The trio crashed on couches, fundraised and took on second jobs to make ends meet while they gathered research from some of the country's top schools. "Teachers are doing a lot of truly wonderful things out there," Healy said. "We wanted to take the best things that we saw and put them together into one school." Their most important discovery was simple and powerful, according to Healy. "Deeply knowing the students is one of the most important factors for success," she said. The teachers saw that schools were the safest and most effective when the educators took the time to really get to know their students, the parents and extended families. "Each child that walks through the door is a unique human," Healy said. "When you get to know who they are and where they come from, you begin to understand how to teach them." Compass Charter opened in September 2014 but Healy, Peters and Sutler had already been in 95 percent of their student's homes over the summer. They knew each of their parent's names and had had experiences with them outside the classroom — like attending a potluck, painting school walls together and a picnic in Fort Greene Park. Also to further their goal, they host a weekly "community gathering" where parents, teachers, students and community members sit together and sing songs by artists like Prince and Lionel Richie in order to deepen relationships. "We want parents to walk away and say, “Wow, these people really know my child,” Sutler said. The community gathering also serves their second priority — to give the children an understanding of social justice, economic justice and the environment. "The lyrics and history of the songs that we sing give us the opportunity to talk about topics that aren't always the easiest," Sutler said. "They set us up for some rich conversations." 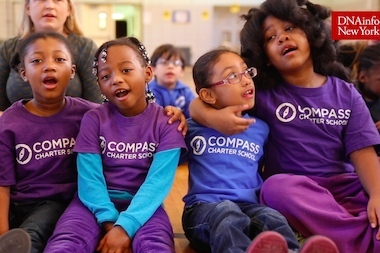 WATCH a video of Compass Charter's Wednesday morning community gathering at 300 Adelphi St. in Fort Greene. DNAinfo New York chatted with the founders of Compass Charter to find out more about what they learned on their trip, what makes their school unique and what's in store for Fort Greene's newest elementary school. What were some of the biggest takeaways from your trip around the country? Healy: Well, first we saw that there are a lot of wonderful things going on in the country that are often overshadowed by negativity about teachers' roles in the media and about our test scores in comparison to other countries. 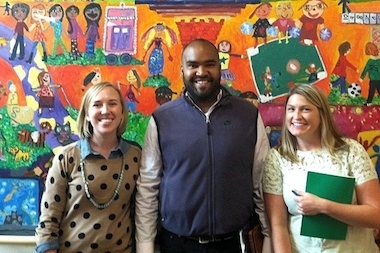 The leadership at Compass Charter School — Michelle Healy, Todd Sutler and Brooke Peters, pictured here, left to right— traveled for nearly a year to learn about best practices from other schools nationwide before opening their Fort Greene school. We saw teachers really taking the time to get to know their students and taking extra hours to make their classrooms feel safe for learning. Peters: The other really important thing that we took from our travels was this focus on sustainability. We saw older students being taught about civil rights and really rich social justice themes and with younger kids social justice themes can come out when you talk with them about their family or community. Like when I was teaching in the Bronx we talked about why there weren’t many grocery stores and why that is. Kids can start to talk about social justice with what they are seeing in front of them and around them everyday. How are you incorporating what you learned into Compass Charter and what makes the school unique? Healy: First of all, each classroom has two teachers; one that is certified in special education and the other in general education. That makes all of the classrooms integrated teaching and everyone gets the benefit of having those two teachers in the room. Peters: We also have a learning support coordinator, a full-time school psychologist, a sustainability coordinator and a music teacher. We have a staff of 17 — with an average of five and a half years teaching experience each — with a little over 100 kids so I think kids are actually getting a lot of attention and a lot of individualization. Music is also a large part of our school. It's another practice that unites people and it is something that is innately in us. It is a very social thing and bands together a community. That’s why we added a music teacher first before any other art — because it is so social and community based. Was there a lot of demand for a new school in Fort Greene? Healy: We had around 575 on our waitlist for kindergarten and just under 200 for first grade. We felt good about those numbers for our first year but it's sad that there's so much demand and not enough seats. What is in store for the future of Compass Charter? Sutler: I would say the biggest goal is to provide a progressive education for kids that don’t typically get access. And in this city that means families with less money, families that are typically African-American, Latin American, Asian-American. And our applicant pool so far has not been that. It is disproportionately middle-income, upper-income and European-American and we want to make sure that everyone gets a fair shot at Compass. So we are aggressively building our outreach program to Head Start programs and meeting with community-based organizations to let them know that our definition of diversity and inclusion is in line with theirs. Peters: For now our goal is to add students each year and grow to fifth grade. That feels like enough!